June in the Dolomites is a low season. I found it hard to believe, but it is the truth. 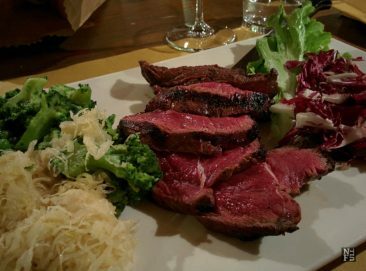 So few people and so few restaurants opened was a novelty to me. 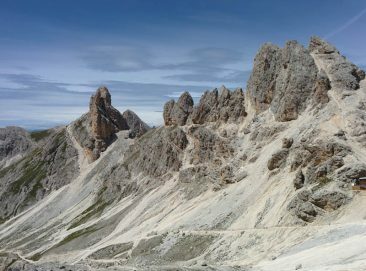 I visited the Dolomites many times before, but it was always either peak winter season or peak summer season. Thus, I discovered it all over again. Trekking in the high mountains is everything that I love most: beautiful view, wonderful colors, fresh air and a bit of a healthy effort (if you wish to climb it). Mountains for me are about the space and the beauty. Up there, I feel like I am alive. Every time I climb a mountain I go through a wonderful and simple process of getting convince that I can do whatever I dream about. It’s a powerful experience of my own strength and weakness. And it brings an amazing sense of completion. I enjoy watching how small steps bring me up to a very high mountain. And above all, the mountain rocks, a pretty unfriendly to all living creatures place, remind me the power of nature and how tiny little space I occupy in this world. My stay in the Dolomites with 3 of my best friends was a wonderful experience, a holiday I needed very much. 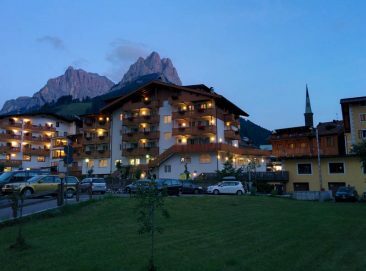 We stayed in AirBnB in Canazei, the heart of Val di Fassa. 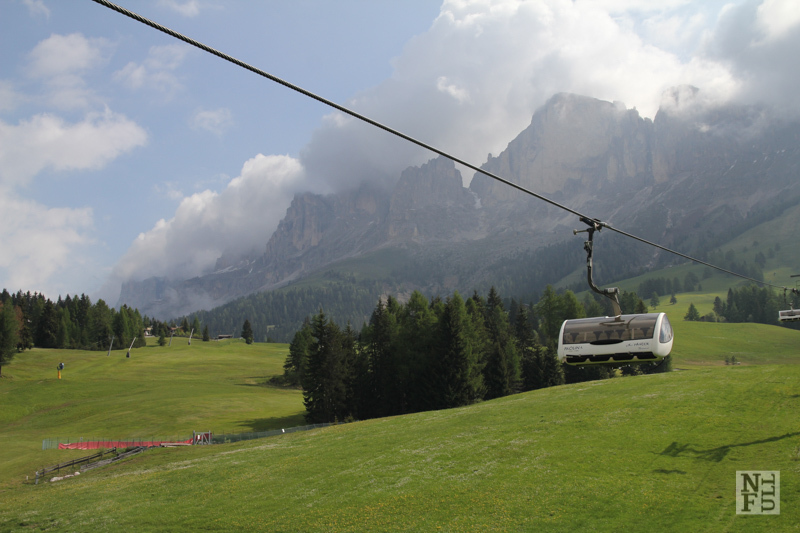 There were only 2 cableways open: Passo Pordoi and Paolina. 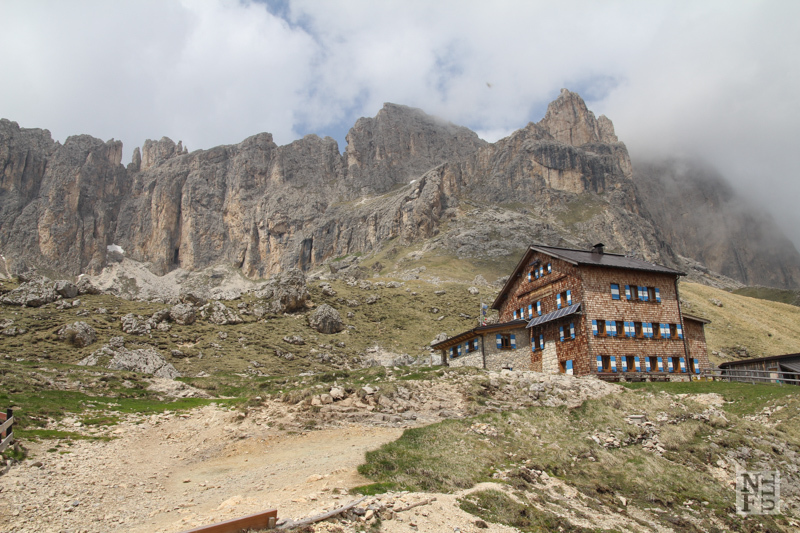 As we visited Passo Pordoi last time we picked up Paolina for the first trekking. And it was a marvelous choice! We went up to 2125 masl using this comfortable cableway that I would even call luxury: there were even windshields with every seat. And going up was entertaining enough as we saw more and more of the panorama appearing out of the clouds. It was chilly and partially cloudy and it was just a perfect condtition for a short trek. Along the way. The Dolomites, Italy. Quite quickly, we arrived at a mountain hut called Baita Pederive at 2280 masl and enjoyed the beautiful view towards Cigolade. Inside, the refuge run by an elderly couple, was warm and it smelled lovely with burn wood, fresh coffee, and strudel. I had a yogurt prepared by the owners out of the milk of their own cows. As fresh as it gets, I would say. We stayed for a while inside, having a snack and talking to the owners. 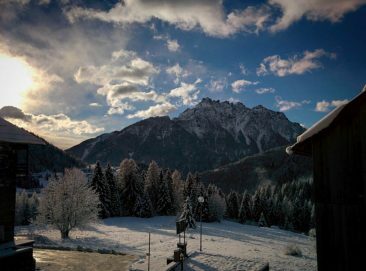 One of them, an elderly man, told us he comes up to the mountain hut and goes home every single day, down in the valley. It’s a few hundred meters of drop. If you multiply it by a number of days when a mountain hut is open it gives thousands of meter this man climbs every year. Coffee in the Dolomites, photo by Massimo. 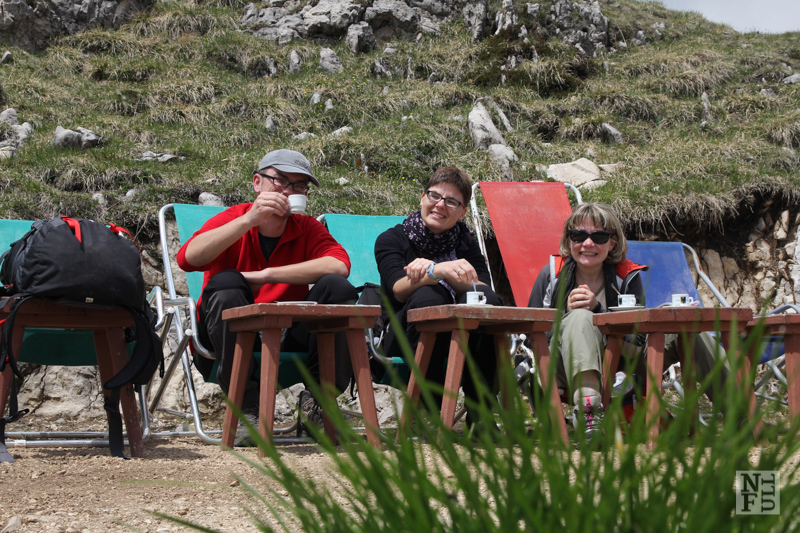 We had a coffee while sitting in the deckchairs and enjoyed amazing views of the valley. 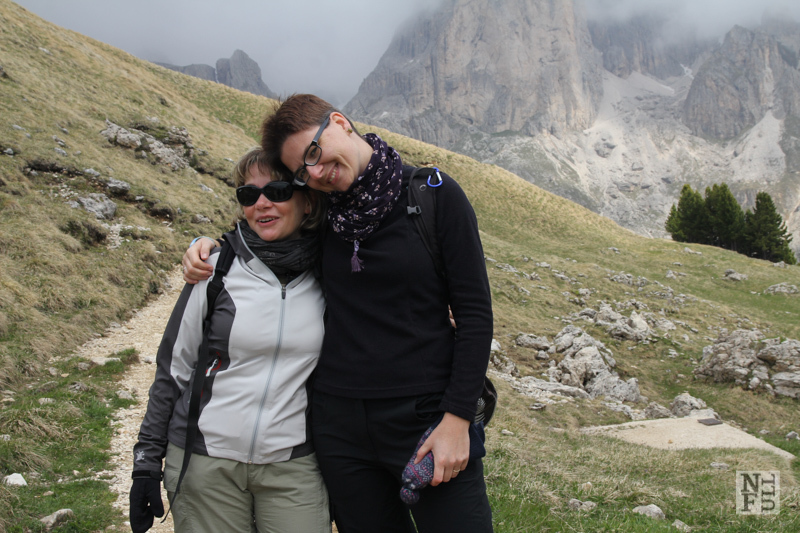 I and Claudia in the Dolomites, Italy. 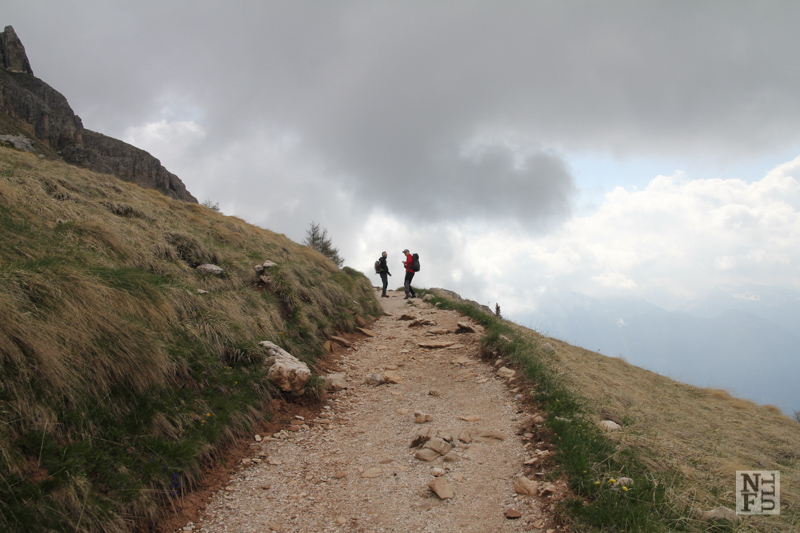 I loved everything about this trek: silence, clouds above, unbelievably green grass which was covering the floor of the valley, and warmth of the summer Italian sun. It was a good start of a full week of a holiday. 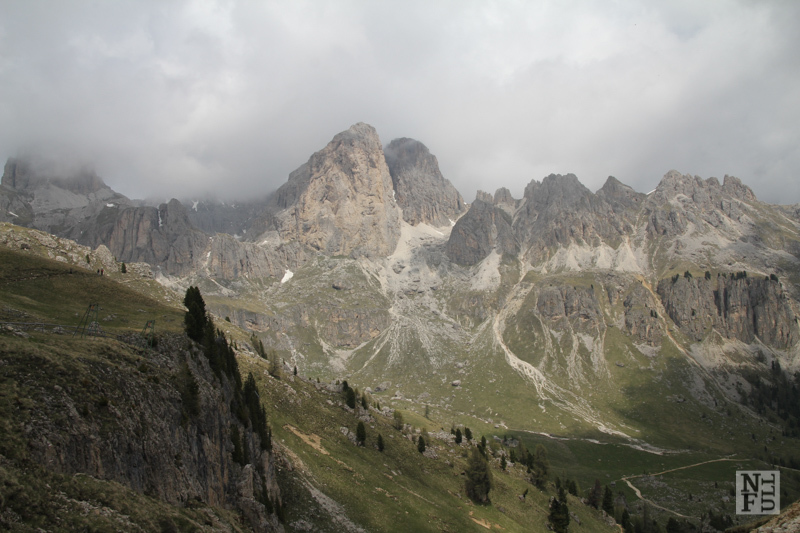 I’m working on more posts from the Dolomites and a wonderful music festival I have recently attended to. Stay tuned for more! Here is the second trail we walked. This looks lovely! 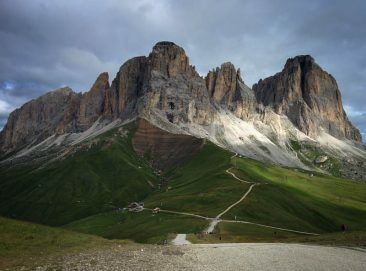 I was shocked when I read that June is not peak season for I would have thought springtime / early summer in the Dolomites would be incredibly overrun with tourists. So glad that was NOT the case. Can’t wait to read your next installment and keep these pics coming too. Indeed! I was surprised too! And for me it did not matter that some of the restaurants were closed. I fully enjoyed no crowds on the track. It was wonderful! Peak season starts in the second half of June and lasts until September to reopen in December for ski season and lasts until March. In general, of course.